Concrete control joints, contraction joints. 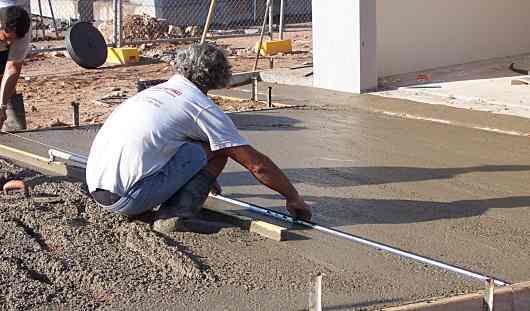 Concrete control joints are joints that attempt to control shrinkage in concrete flatwork. Other names that come to mind for the same thing are weakened plane joints, contraction joints, sawn joints and crack inducers. They have been used for a long time, and some new and interesting variations are appearing on the scene. Concrete control joints - A modern metal key joint. This allows the rebar to be cut and and so let the slab expand and contract, and yet it stops any vertical movement between the two. A general rule of thumb is to place a control joint in a slab at least every 3000. I have seen other criteria for spacing the joints, based on the thickness of the slab. For example "the joint spacing to be no more that 30 times the thickness of the slab" That would make a 100 slab to have joint every 3000. With thicker slabs being allowed longer spacings. For slabs wider than footpaths the longest side of any section should be no longer than 1.5 times the width of the shorter side. There is one exception. That is in thinner slabs than 100. Small 75 thick footpaths I like to see joints at 2000 max. We have a requirement in the BCA here in the tropics that we have to place a termite reticulation pipe around the whole of a new house's perimeter. This enables us to pump in anti termite chemicals at set intervals. This pipe if it not otherwise covered by driveways and footpaths has to have a 300 wide concrete cover. Even though these are generally 75 thick also I like to put control joints in at max. 1500. Concrete control joints - Placing a proprietary metal joint into freshly screeded concrete. The guys have a string line to work to and the trick is to lay the joint on the surface so that it is in a straight line, and then just roll in into the wet surface. It is normal to cut the reinforcing mesh at concrete control joints. The normal distance for any reinforcing steel from the joint is 50mm. Many times this is ignored and the mesh is left to run through. Again it comes to spacing, if the joints are closer than recommended then it may be OK to run the mesh under the joint, and also on footpaths say at every second one. For important work and definitely on concrete slabs that will receive a decorative finish always cut the mesh. It costs nothing to do this and it is a sure way of forming a proper joint. There are some exceptions to this rule of course. If the subgrade consists of highly expansive clays then leave the mesh continuous. In cases where you may feel that the subgrade is a bit questionable it is possible to make a break every second bar in the mesh. The joints should be planned ahead and marked clearly on the formwork. In the hustle and bustle of concreting the last thing that you want to do is to get a tape measure to start setting them out again. Wet concrete and tape measures don't mix. some different types of joints. Concrete control joints - Different types of joints. This joint is normally made by flicking a line on the wet screeded surface the a bolster is used to cut down into the concrete to separate the aggregate to each side of the joint. After smoothing over the cut with a trowel or bullfloat which fills the gap with fines, a straightedge is laid on the surface as a guide and a jointing tool is used to finish the joint. The idea is to get at least a quarter to a third of the thickness without and aggregate on the joint line. A very cheap but time consuming joint, easy to do in narrower sections like footpaths, and needs a plank support across wider slabs. Concrete control joints - A crack inducer used in conjunction with a sawn joint. Ever since the advent of cheap diamond saws this has been the method of choice for most larger sized jobs. The advantage of this method is that the concreting can proceed at a steady rate without any thought of the concrete control joints until the following day. Timing is critical, start sawing too soon and you risk plucking up pieces of aggregate that could mar decorative finishes. Saw it too late and cracks can start in the wrong places. As a rough rule of thumb sawing should be done no more than 12 hours after pouring if the temperature is over 25 degrees (C) and not more than 16 hours for colder temperatures. Saw cuts are a good joint to use if the surface finish is going to be ground and polished and also they are a good choice for the deeper stamped finishes. Made out of roll formed thin metal they get their stiffness from the shape. About 30mm deep they come in 3000 lengths and are easily cut with a hacksaw. They are used extensively in stenciled and exposed aggregate concrete finishes because they give a very neat finish. Comes with the rubber cap in a small range of colours. In heavier floors or more critical areas these joints can also be provided with punch outs for inserting dowels. They can also use the coloured rubber top edges making them a good choice for some decorative finishes. A lightweight roll formed metal "witches hat" shape that is pinned down to the subgrade in the position of the joint. Used in conjunction with the other type of joints shown here (except the keyjoint) to give a far more accurate and positive break. << BACK: Concrete expansion joints. A bricklayers tool. It is essentially a wide (100mm) but thin (6mm) all steel brick cutting version of a cold chisel.